In this post, we will be discussing how we can use EventWaitHandle to signal between different windows. 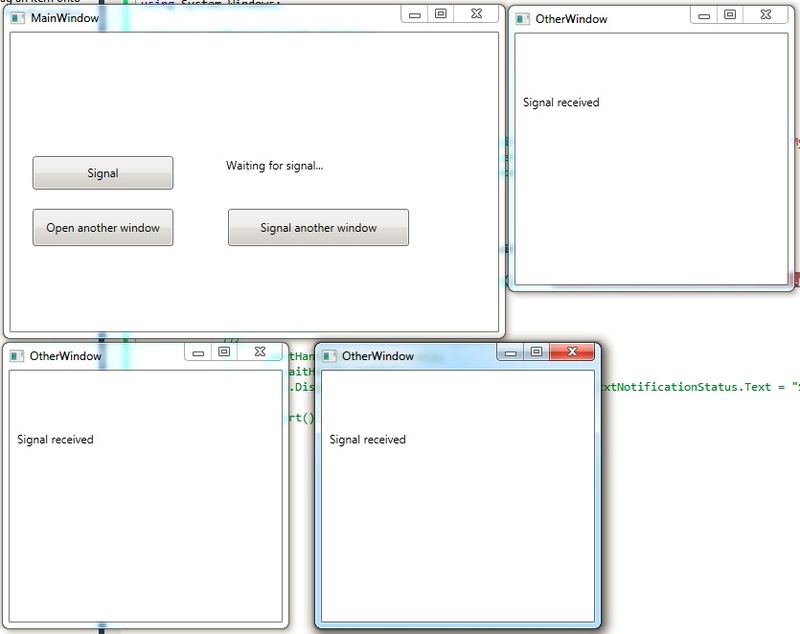 We will also see how the same logic applies to signal between different processes. We will find how we can consume these notifications using regular threads and ThreadPool’s WaitHandle registration features. 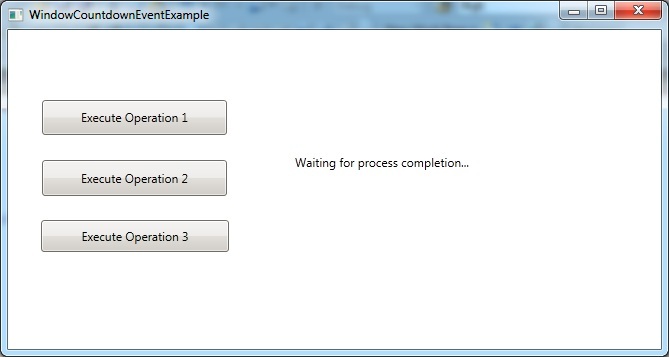 In the later part, we will be touching on CountdownEvent which is a new feature in .net 4.0. 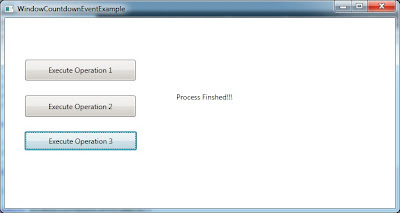 Let us create a sample application. It has two kind of windows. One window would serve as Server Window. 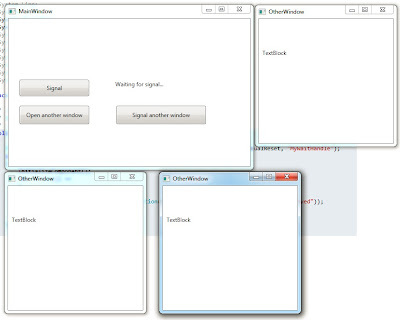 It has a responsibility of generating notifications for different parts in the same window or across different windows in the same or different processes. 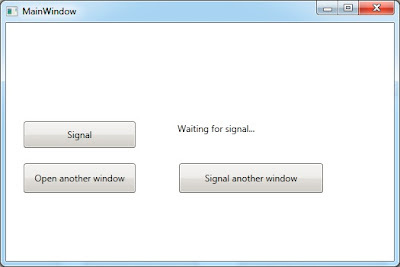 <Label Content="Waiting for signal..." Height="38" HorizontalAlignment="Left" Margin="220,125,0,0"
<Button Content="Open another window" Height="39" HorizontalAlignment="Left" Margin="23,184,0,0"
<Button Content="Signal another window" Height="39" HorizontalAlignment="Left" Margin="227,184,0,0"
In the above code, we are creating an AutoResetEvent, named _waitHandle. In the constructor, we are waiting for this EventWaitHandle in two different threads by calling WaitOne on this EventWaitHandle. As soon as the thread is notified, we are setting the content of LabelStatus as Signal received1 for first thread and Signal received2 for second thread. When the constructor ends, two threads are ready to receive notification. As soon as they would receive the signal, they can resume their operation. 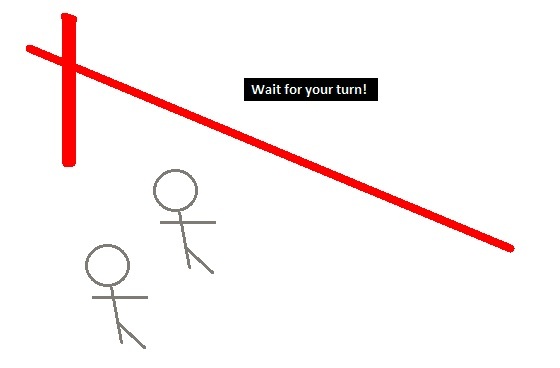 Since this is an AutoResetEvent, each thread would wait for its turn. 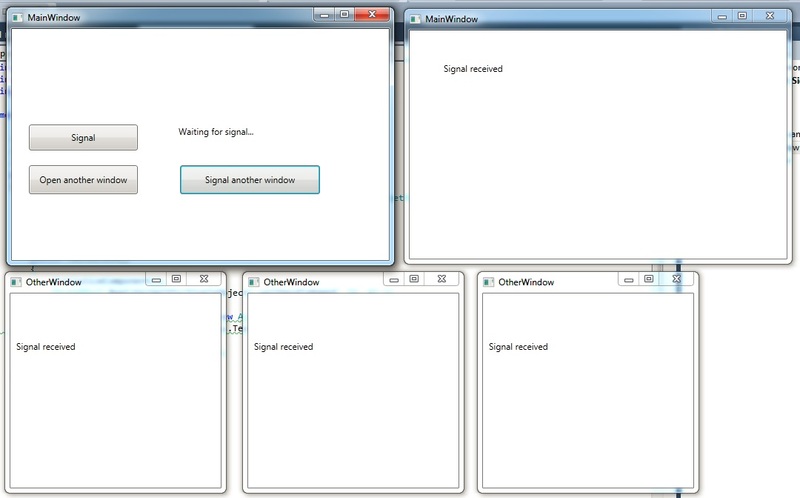 A signal is received by only one. This one is generally the one at the top of the queue. Now run the application. 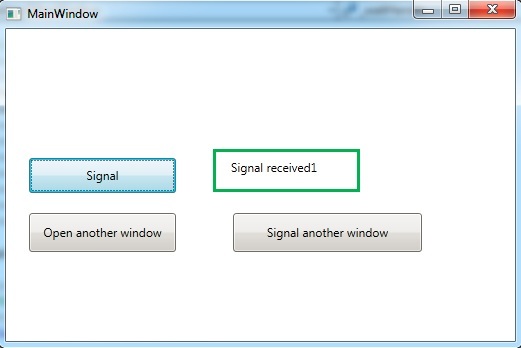 Click on Signal button. The first thread in the queue gets the signal. This thread now can resume its operation and updates the Label Status as Signal received1. 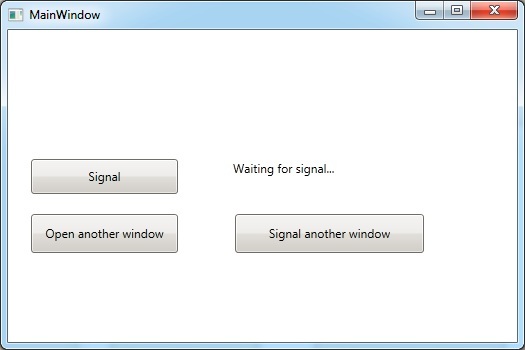 Now hit the Signal button again. Now second thread gets the notification and updates the LabelStatus as Signal received2. In this window _waitHandle is the similar EventWaitHandle as in MainWindow. 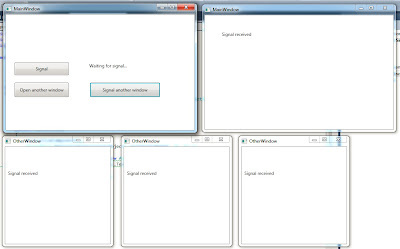 This is a ManualReset type of EventWaitHandle. The name of event is “MyWaitHandle”. 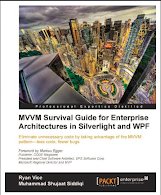 Like MainWindow’s, here we are starting a new thread which is waiting for this EventWaitHandle. It must be remembered that as soon as a Signal is received for ManualReset EventWaitHandle, all threads waiting for the signal gets this notification and they resume their operation. After signal has been generated, any thread which is waiting or will be waiting in future finds this open gate and just continue running unless the EventWaitHandle resets. 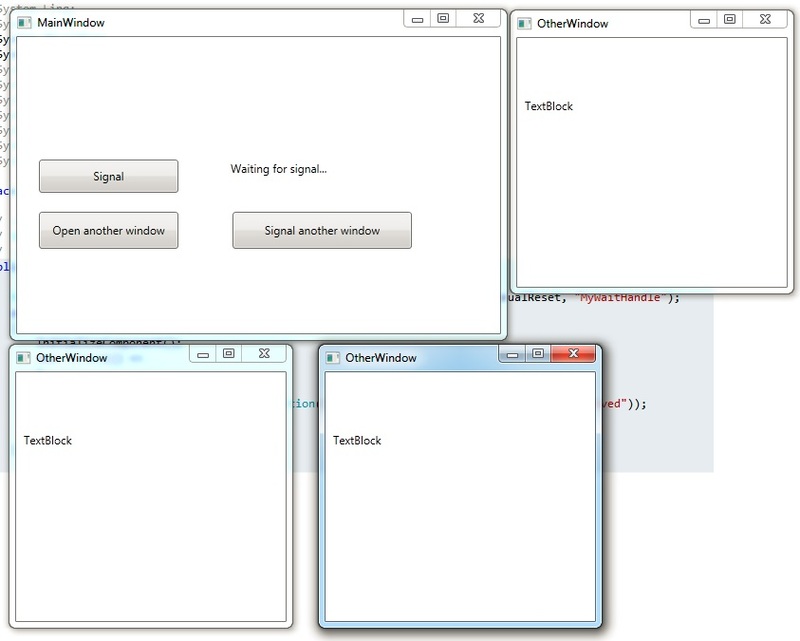 In order to test this, lets click Open another window button three times showing three instances of AnotherWindow. 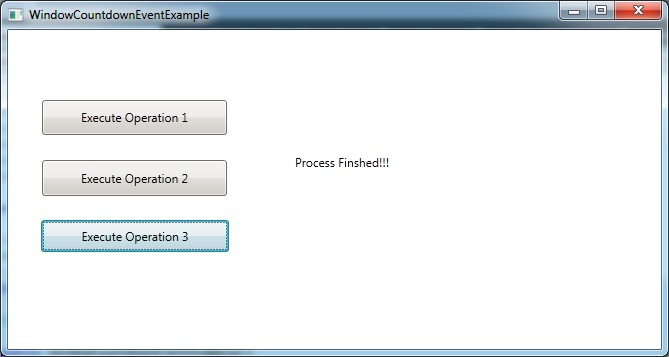 Here we are using ThreadPool functionality of handling EventWaitHandle. 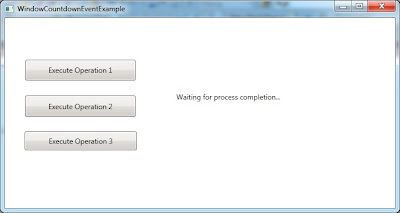 We are registering EventWaitHandle using RegisterWaitForSingleObject method of ThreadPool. For this method, we need to specify which Event to wait on (_waitHandleNamed). We also specify if there is a Timeout. Since we can wait forever, we are specifying Timeout as Timeout.Infinite. The last argument is specified as true. 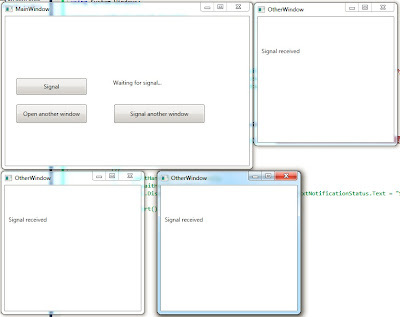 This is to specify that we are interested in just one signal, otherwise, after finishing executing the handler, it would continue to wait for more notifications. Resume, only when all operations are completed! 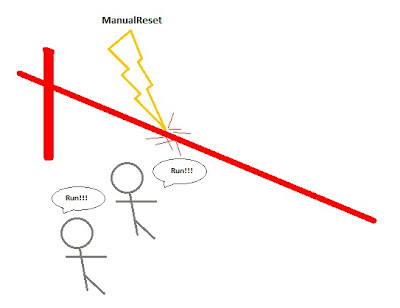 In the above examples, we have considered the examples of AutoReset and ManualRest EventWaitHandles. 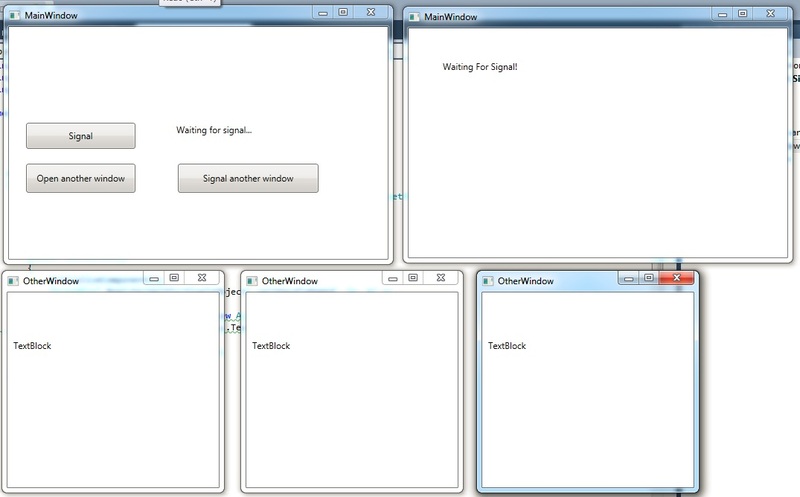 .Net 4.0 has introduce a new signaling mechanism between threads. This is called CountdownEvent. Though this is named like the other two and it is also used in signaling between threads, it does not inherit EventWaitHandle unlike other two. <Button Content="Execute Operation 1" Height="35" HorizontalAlignment="Left"
<Button Content="Execute Operation 2" Height="36" HorizontalAlignment="Left"
<Button Content="Execute Operation 3" Height="32" HorizontalAlignment="Left"
Name="textNotificationProcessFinish" Text="Waiting for process completion..."
Note: Since CountdownEvent does not inherit EventWaitHandle, there is no named CountdownEvent available in .net 4.0. Had there been any named event available for this type, we might implement many scenarios efficiently just by using CountdownEvent. This seems to be a big limitation.